New Melones Lake is currently holding 509,734 acre-feet of water. The lake level dropped slightly this past week. It is currently at 860 ft. above sea level and 225 ft. from full. The water clarity is clear in most of the lake with a slight stain in some areas. The water temperature is cooling, with the average being 58-63 degrees. The concrete ramp is CLOSED and is no longer in use. There is also a courtesy dock on the dirt launch which will be in place until the concrete ramp is open again. Joe Caccamo and Trip Bailey caught two really nice fish trolling Needlefish Spoons near the spillway. Thier biggest weighed 4-pounds, 1-ounce. The rainbow trout coming out of New Melones are extremely healthy and are weighing from 3 to 5-pounds. They have been holding in deep water and feeding on shad. Some fish are still in deep water and some are starting to move toward shallow water and feeding on the surface. Trolling anglers are dropping down 80' to 100' to catch these larger fish. Try fishing the main lake and main river channel. Spoons and Rapalas have been working well, both in natural and brightly painted patterns. Try adding a feathered treble to your lures to enhance the action. Trolling at a faster speed has been helping trigger a few more strikes. Top-lining and leadcore are an option and will catch some of the fish that have moved up in the water column. Plus, it is a good way to fish over submerged timber and in creek channels without getting stuck. Bank anglers have started to catch a few fish from the shoreline. Try using Power Bait or a crawler/mallow combo to entice the fish cruising in shallow water. A casting spoon or Tasmanian Devil can be used to cover water. Glory Hole Sports Big Fish of the Week goes to Scott Heliotes and Frank Curcuro. They caught three big trout and one kokanee. 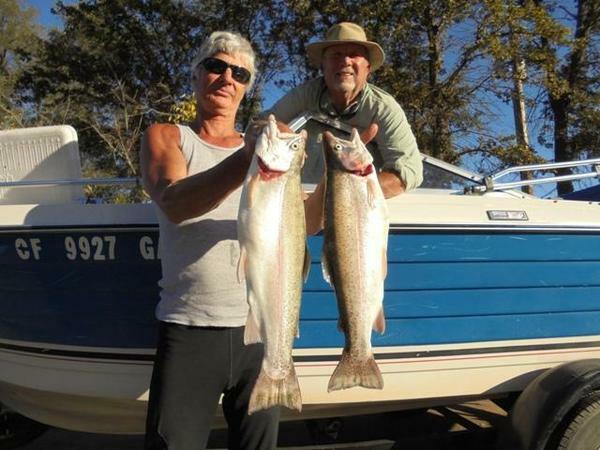 Their biggest trout weighed 4.65-pounds and was caught on a Rapala trolled in 80' of water. Michael Nelson caught a very nice 3-pound, 9-ounce rainbow trout. The fish came out of 110' of water and was caught on a brightly painted Speedy Shiner. Mario Lopez and Rick Corbett caught three nice trout trolling near the spillway. 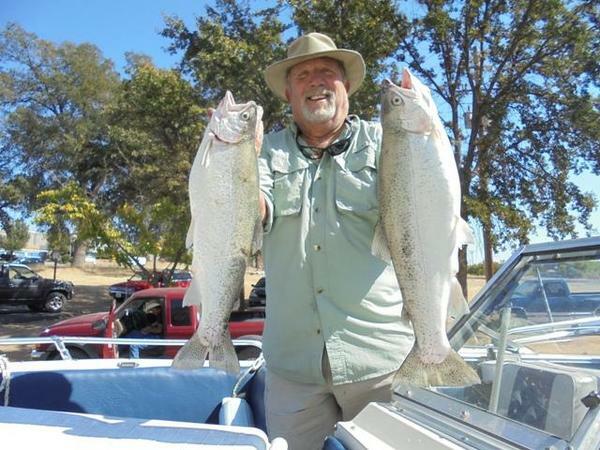 This gentleman caught a nice 2-pound, 14-ounce rainbow trout. Unfortunately we did not get his information before he left. The bass bite has been picking up each week of the fall. The cooler weather and dropping water temperatures have them feeding more aggressively and more often. Many fish are holding in deep water and feeding on schools of shad. Some fish have moved up toward shallow water and can be found in standing timber and brush. To target fish that are holding deep, try using a vertical presentation. A dropshot or jigging spoon can be lowered to the fish and held in the strike zone for a long period of time. To catch fish that have moved shallow, try using a shakeyhead with your favorite worm or creature bait. Shad and crawdad patterns will work well. When fishing in areas with head cover use a weedless presentation. A Texas Rig/brass and glass setup is hard to beat. Use the bead to create a ticking sound and attract nearby by fish. Many fish are crawdad eaters and will scour the bottom in search of them. A 1/2-ounce football jig is a great choice. Use a slow drag and hop presentation. California Reservoir Lures offers some great colors for Mother Lode lakes. Melones Craw and Mother Lode Perfect Craw are both good choices. PLEASE PRACTICE CATCH AND RELEASE. Take photos and carefully release the fish back into to the lake to maintain a healthy fish population for generations to come. Jim Mellinger brought in the first catfish of the contest and received a $25 gas gift card. His fish weighed 8.37-pounds and was caught on chicken liver. Glory Hole Sports Fall Catfish Contest has begun and couple nice catfish have been brought to the scales. We still have some openings and it will be going for the entire month of November. We are very excited to see some of those giant New Melones catfish. We are giving away over $300 in raffle prizes, plus the entry fees will be paid back to the top three anglers. This is a great time to target the largest catfish in the lake. They will move shallow and feed heavily in preparation for the colder winter months. Many different baits and presentations will work well. Frozen fish is always a good choice and some big fish are caught on it each year. Try using mackerel, anchovies and frozen shad. A weight-less approach often works best when fishing with frozen fish bait. Use enough bait to make a cast and let it fall slowly to the bottom. Chicken liver and nightcrawlers are hard to beat. Many anglers will soak their bait with Mike's Lunker Lotion, Berkley Catfish Attractant or Pro Cure. Catfish have very poor eyesight and will feed primarily by smell. Use Miracle Thread to keep your bait secured on the hook. Catfish can be caught near standing timber, large rock piles, points, humps and creek channels. Try many different areas and depths until you locate a catfish hang out. Glory Hole Sports Big Fish of the Week goes to Matt Meek. 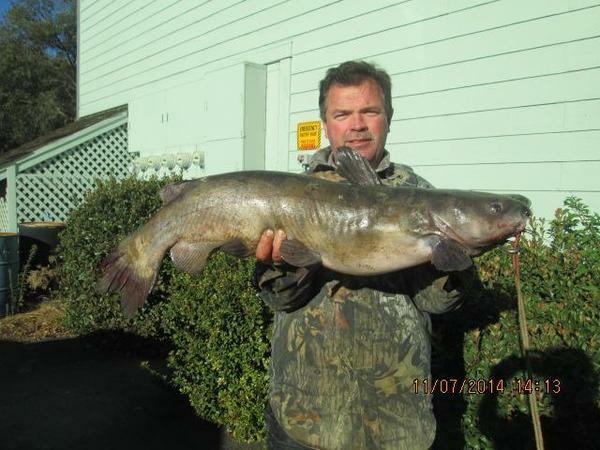 He caught a 9.19-pound catfish while soaking shad in 20' to 30' of water. The crappie bite has been slow. Some anglers are catching a few nice ones once they have located a school. The cold winter months can be a good time to target crappie. Look for them in the back of major creek channels. Mini jigs work well.